Is Maine Brewing the Country's Best Beer? Is Maine Brewing the Country’s Best Beer? Maine has only 47 breweries, but good beer has saturated the culture and pubs. Flickr photo via Jimmy Emerson. Just before Thanksgiving, a Nor’easter blew into New England. It blanketed Maine under four or five inches of snow, followed by a cold snap that kept the countryside looking Rockwell-picturesque. 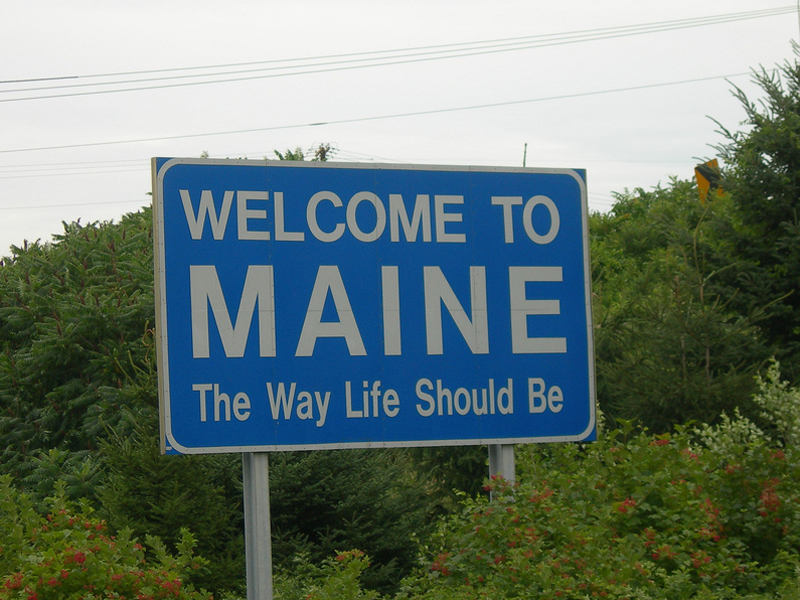 Maine is almost entirely rural, and though it has many (many!) delights, few consider trend-setting to be among them. And yet, when I set out on a Saturday pub crawl under brilliant skies, snow crystals sparkling like gemstones on the roofs of 18th century farmhouses, what I found was arguably the richest vein of good beer in the country. My first stop, at a brewpub called Bray’s in Naples (population 3,800), is a good example of why. Outside of the greater Naples-Poland region, I doubt few people have ever heard of Bray’s (and even some Mainers, like my wife, couldn’t remember exactly where Naples was located). It has survived in anonymity for 20 years, pumping out 3.5-barrel batches of beer to slake the thirst of locals distracted by Red Sox games. This is the last place on earth you expect to find anything experimental, and yet they were pouring a non-gimmicky, sweet-potato amber and a sour ale. They had Verhaeghe Duchesse De Bourgogne and Delirium Tremens on tap. The local cider option was made with Maine apples and fermented naturally. It was a big-city tap list in a small town. The most intriguing beer, though, was a guest tap from Hidden Cove Brewing Co., a brewery in Wells. The name was innocuous enough—Crowsfoot Black Ale—but it arrived venting the unmistakable aroma of Brettanomyces. It turns out this is not exceptional: the regular line includes two more beers both made with brett, including an IPA with a 50 percent grist of rye. Hidden Cove has only been around since 2013, but if the Crowsfoot is any measure, it’s doing something special. The use of brett is clever and very understated; it gave the black ale a dry, austere snap that reminded me of descriptions I’ve read of 18th century London porters. Located in a town like Denver or San Francisco, this would be a buzz-generating phenomenon; in the Pine State it seems to have gone unnoticed. Maine obviously can’t compete on numbers. The least-densely populated state east of the Mississippi, most of the towns are crowded down in the south and along the coast. It’s only got 47 breweries. People acknowledge that it has good beer, but it’s never placed among the most glamorous and it won just a single GABF medal this year. Nevertheless, in the ways that matter, Maine is at the beery vanguard. Good beer has saturated the culture and pubs—as Bray’s demonstrates—regularly have interesting, unexpected beer. None of this was unfamiliar to me—it’s been this way for years. What was striking was the degree to which breweries are now pushing the envelope on innovation and quality. As an Oregonian, I’m used to measuring cities by the number of years their beers trail ours. Maine’s scene isn’t trailing anyone, though, and their Portland may now be the equal of Oregon’s Portland. Seriously. 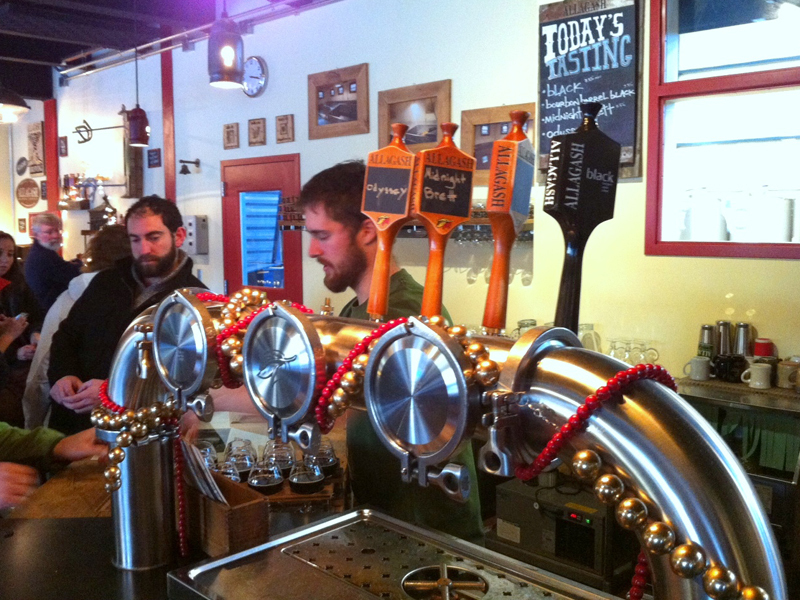 Once off the beaten beer path, Allagash Brewing Co. is now a major tourist stop. Photo by Jeff Alworth. Part of this comes from having a long lineage of good craft breweries, including a couple that are world class: Geary’s Brewing Co. and Allagash Brewing Co.. Geary’s created the template still followed through much of New England for English-inflected ales. With London Porter, David Geary created a taste for dark ales and you find a greater density of porters and stouts than anyplace I’ve visited. Allagash is more widely-known, and also hugely influential in the region. The last time I visited the brewery was in 2008, and it was a steel warehouse along an industrial row. They’d roughed out a little visitor’s room, but it was way off the beaten beer path. Now it’s a major tourist stop, with a vastly expanded tasting room and throngs of devotees and visitors. In’finiti Fermentation & Distillation brews beer and also distills and has rum, vodka, and white (unaged) oat whisky. Photo by Jeff Alworth. In regions with immature beer cultures, new breweries can’t rely on a customer base to support beer that’s overly avant garde. In mature cultures, it’s the opposite—new breweries have to distinguish themselves to find an audience. 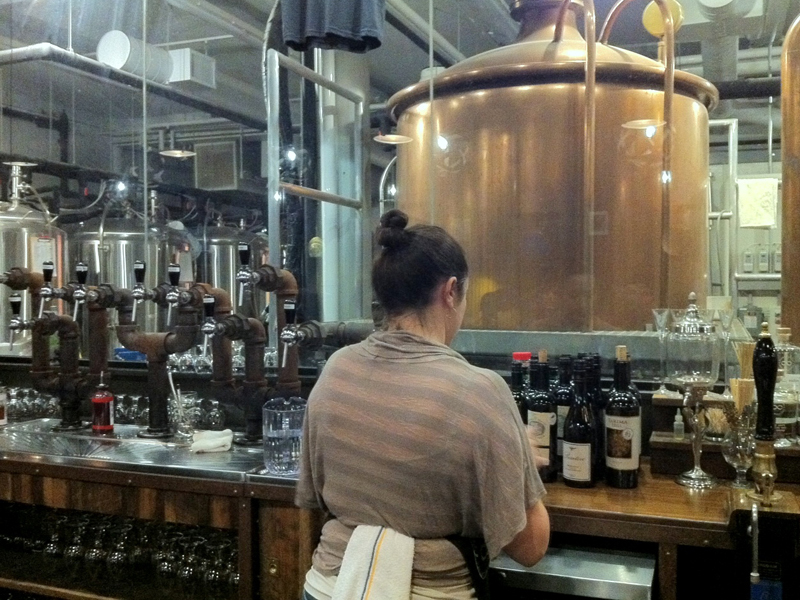 Case in point: a new brewery located on the waterfront in downtown Portland, In’finiti Fermentation & Distillation. It doesn’t have a regular lineup, and instead relies on regulars to return for variety. And what variety—the day I visited it had everything from a helles bock and rauchbier (looked like Spezial, tasted like Schlenkerla) to English, American, and Double IPAs to Belgian strongs and two tart ales, including The Killing, made with cranberries. That last beer took the laurel for champion beer on my trip—it was about as acidic as wine and nearly as fruity, soft and crisp. I tried five of the beers at In’finiti, and they were all well above average. The rauchbiers and tart ale were exceptional. In’finiti also distills and has rum, vodka, and white (unaged) oat whisky—with a barrel-aged version to come eventually. They even do beer schnapps, a liquor so new it’s not mentioned on the website. It’s a brewery with huge ambition, and the throngs I saw seemed to approve. I understand the folly in trying to measure the quality of beers by city or state. We all have different criteria and standards (not to mention personal experience), so this is a matter of philosophy, not science. I’ve been to a lot of places with great beer, though, and I’ve only encountered beer this impressive in places like Prague and London. As a fairly shameless home-state booster, I would still give Oregon the pole position for best state, but for the first time, I had to stop and question my rankings. If you think your state is a contender, book a trip to Maine. You will be dazzled and impressed. Read more about In’finiti Fermentation in the January 2015 issue of All About Beer Magazine, on newsstands now. Oxbow, Rising Tide, Bissel Brothers, and Barreled Soles also. Cheers! I’m surprised not to see Maine Beer Co. mentioned as a standout up there. I’d love to see their stuff get to the Midwest! Maine Beer Co is by far brewing the best beer in Maine and probably the Northeast. To not mention them is a bit of a joke. Extremely surprised to not see Shipyard on this list!! As a loyal patron I would think Shipyard would be listed in top Maine Brews!! Blogging is not a precise science. I meant to bolster my case by mentioning Maine Beer Co. One of their pales highlighted my trip, and offers a nice riposte to West Coasters who believe they alone have mastery of the hop. But I spaced it. Sorry MBC!